Lisa Samar 11/27/2018 $50.00 good luck girl friend! Gordon Shepperd 11/27/2018 $100.00 Good Luck! Barbara A Campagna 11/27/2018 $15.00 From Max Willig, a modernist if there ever was one! Kelly Hayes McAlonie 11/27/2018 $50.00 Three cheers to Brutalism! Barbara A Campagna 11/27/2018 $100.00 Why Not? David N. Fixler, FAIA 11/27/2018 $25.00 Keep it going ! Gina Crevello 11/27/2018 $25.00 Keep up the great work! Fantastic, you are already there! Amy Woods 11/27/2018 $50.00 Good luck Barbara! Go Brutalism!! Carla Yanni 11/27/2018 $25.00 Go Barbara! Jean Carroon 11/27/2018 $100.00 Go Barbara! Derek King 11/27/2018 $100.00 PresStudios picked our champion! Jill Gotthelf 11/27/2018 $25.00 You Rock! Elayne Janiak 11/27/2018 $25.00 Not sure about Brutalism, but always willing to bet on you, Barbara Campagna! Thomas Fraehmke 11/27/2018 $100.00 So happy to support the Professor who first made me aware of architectural preservation! Anna Mod 11/27/2018 $50.00 YeeHaw!! Terri Anderson 11/27/2018 $25.00 You've already won but it's never too late to support Docomomo! Barbara A Campagna 11/26/2018 $25.00 Just trying to keep up while I can! Corey Wiktor 11/26/2018 $50.00 From Christine and Corey. GO B.A.C.!! Karen Holt 11/26/2018 $25.00 Go BAC! You’re simply the best! 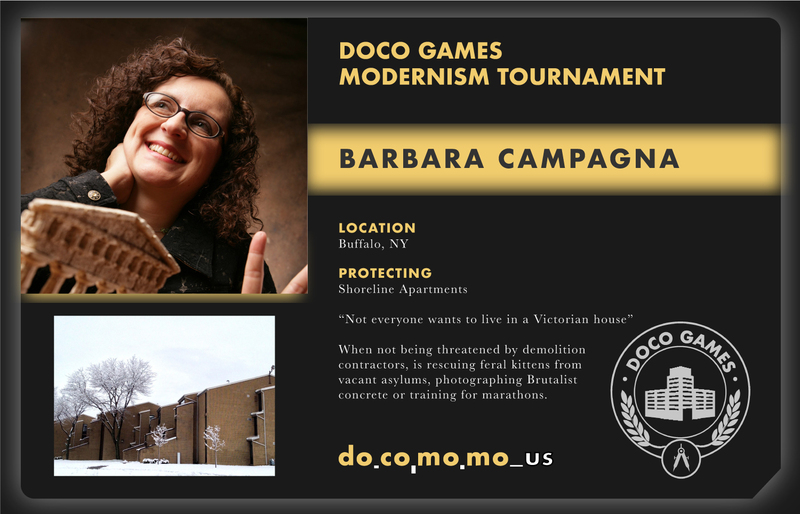 Barbara A Campagna 11/21/2018 $50.00 May the best Modernist win!